There were quite a few of the caramels in the bag, and they were all covered in lovely shiny chocolate. I bit in and found that the centre was pretty too, there was a touch of gold glitter in the caramel that sparkled in the light. The caramel oozed out by the way as it was very runny. 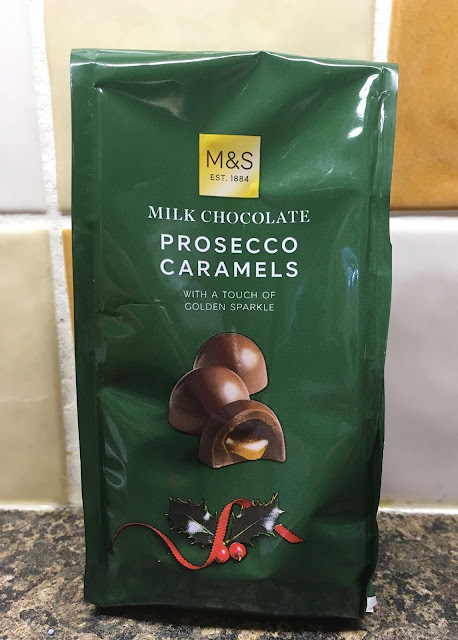 I loved the flavour, the caramel centre was sweet but the added touch of Prosecco gave it a dry edge that worked well. The chocolate was thick and the cocoa flavours wrapped it all together. They are a grown up taste but they do work. 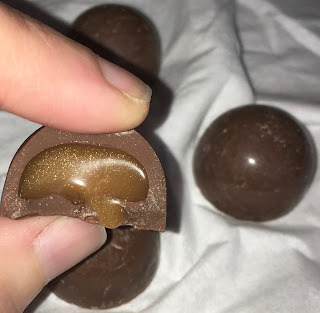 These are easy eating chocolates with a touch of Christmas magic making them extra special. I also picked up a bag of Milk Chocolate Orange Caramels in the same range, and I can’t wait to dig into those too.